Today is the birthday of Fess Parker, the actor who gained great fame in Disney's three-part, made for TV movie, Davy Crockett - King of the Wild Frontier, later edited into a theatrical release. Fess had only done some small roles in movies, and it was from viewing him in the sci-fi 'B' movie, Them! that Walt Disney himself thought that Fess had the right look and personality to play the frontiersman, Davy Crockett. The film was a huge hit with viewers, and young kids created a mass demand for coonskin caps so they could play at being Davy too. For Fess Parker, it was the role that made him a star, and he went on to doing several more films for Disney, including the sequel, Davy Crockett and the River Pirates. 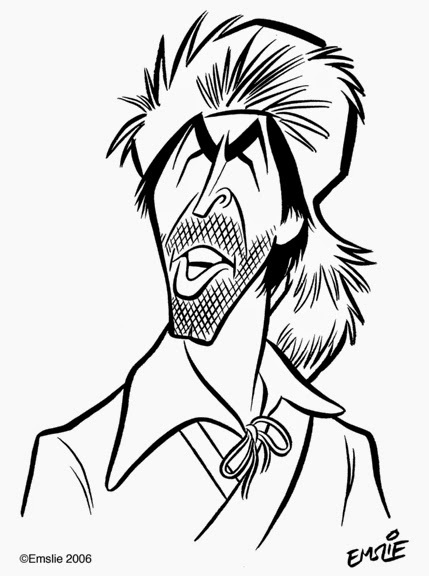 This caricature of Fess as Davy, I first drew for a publication called Persistence of Vision, a first rate historical journal from the early 90s that was created by Paul F. Anderson, a very knowledgable historian on the Disney films and Disneyland park attractions from the era when Walt Disney himself was still running the studio. Though the publication has run its course, Paul continues to document the studio's classic films and attractions on his Disney History Institute blogsite. I highly recommend it! 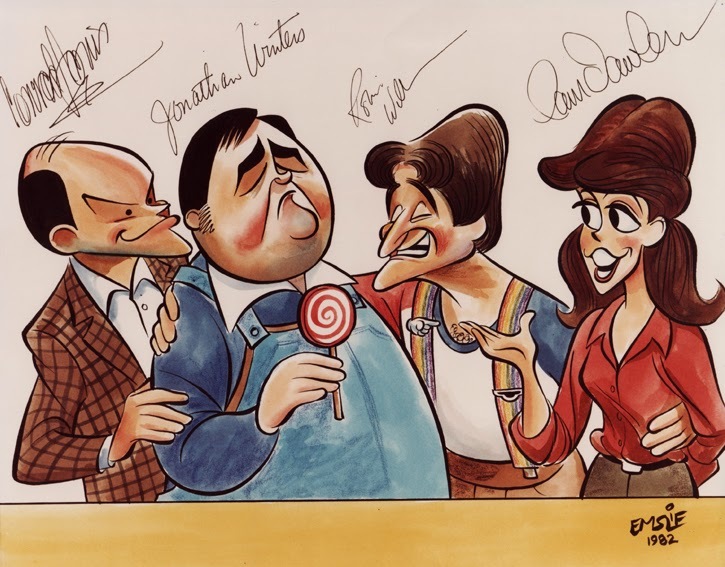 More recently, this caricature was also used on the cover art I did for one of the volumes of Walt's People, a series of books published and edited by Didier Ghez, collecting interviews with various notables from Disney animated and live-action films, as well as those involved in the development of the Disney theme parks. Didier currently operates the Disney History blog, also devoted to the films and attractions of classic Disney. I just got home to hear the tragic news of the death of Robin Williams from an apparent suicide. For all of his outward wild humour, he must have been a tortured soul. His death only a couple weeks after the death of Jim Garner marks a very strange coincidence for me, as I had met both of these actors while on my vacation to Los Angeles in 1982. I'd written about my visit to the set of Mork and Mindy on the Paramount lot on this earlier blog post. As I mentioned in that post, I noticed that Robin Williams could turn it on and off so suddenly, as he was wild on the set while rehearsing, yet was very quiet and reserved backstage in the break room. Sadly, it does not surprise me to now find out that he was given to severe bouts of depression. I really don't know what else to say, as this news is a real shocker. I hope the poor man has found inner peace now.